Here at St Cuthbert’s we baptise or christen (both words are used to mean the same thing) both adults and children or infants. During a baptism (or ‘christening’) your child will be baptized with water. It’s the start of an amazing journey of faith for your child and a special day for all your friends and family. We would be delighted to take that first step with you. 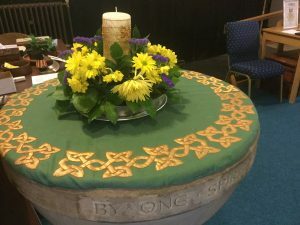 Christenings will take place either during the Sunday morning service at 9am, or on a Sunday at 3pm. Your child is precious to you and precious to God. You want the very best for them, and so does God. You want them to make right choices in life, for themselves and for others. A christening is just the beginning of this and so much more. • Being there for your child to talk to about the bigger questions of life – questions about hope, faith and love. • Praying for your child through the ups and downs of their faith journey. • Showing them practically how to make those good choices in life. • Helping them to learn more about their Christian faith, through their church and in other ways. 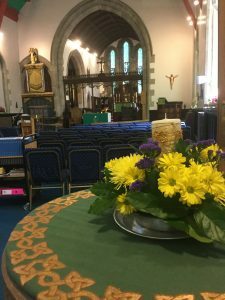 Download more information about christenings at St Cuthbert’s here. 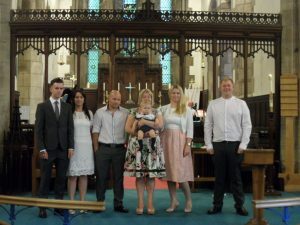 This Church of England website might be helpful in explaining what happens in a christening service here. Increasing numbers of older people – from teenagers to great grandparents – are making their own decision to join the Church. For some people this comes as a sudden conversion. For others, a curiosity about God or about the person of Jesus grows into a gradual awareness of his presence and an increasing conviction that he demands some sort of personal commitment. Some people get involved with their friends or their children in the social activities of their local church, enjoying the friendship of Christian people and get interested in the Church for its own sake. Gradually, they, too, want to belong. If you would like to know more please contact one of our clergy. If you are considering baptism and would like to learn more about what Christians believe, the short videos on this page might be helpful.